A very exciting development in the diagnosis and therapeutic monitoring of cancer is the discovery that blood and urine contain nucleic acids derived from cancer cells that can be used to as biomarkers. DNA, RNA, and microRNA derived from tumor cells can be measured with high sensitivity techniques in the blood and urine of cancer patients. These measurements are termed liquid biopsies because they permit the non-invasive and repetitive sampling of patients, not possible with conventional biopsies. 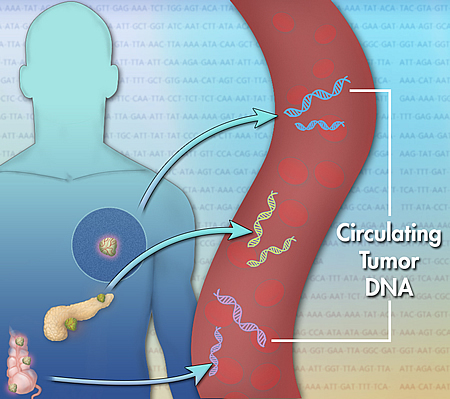 The detection of Circulating Tumor DNA (ctDNA) is receiving a great deal of attention because studies have shown that it can be detected in many cancers and it can be used to monitoring the therapeutic progress, including the development of drug resistance mutations in tumors that is reflected in the ctDNA. The hope is that ctDNA can be used for early detection of cancer, but a large amount of research is needed to determine the true clinical utility of the measurements. The ctDNA is detected at relatively low concentrations in a background of normal (wild type) nucleic acids. The allele frequencies of ctDNA required to detect the presence of cancer are as low as 0.01%. In addition, the DNA present in blood and urine is degraded to low molecular weights. The accurate measurement of these low concentrations of cancer mutations in a large background of normal DNA is a significant analytical challenge. Additional research on the pre-analytical processes step and methods for analysis need to be done before measurements of cell-free nucleic acids becomes routine in clinical laboratories. NIST can help the EDRN validate measurements with cell-free nucleic acids with reference materials, studying pre-analytical variables, and interlaboratory testing to determine the quality of measurements obtained in different laboratories. In the current EDRN NIST Interagency agreement we have recently started a program to ensure high-quality measurements of low frequency mutations in circulating tumor DNA (ctDNA). We are developing validated assays for frequent genomic mutations using sensitive and selective quantitative PCR and droplet digital PCR methods. We are also working on developing suitable reference materials for interlaboratory testing of circulating nucleic acids in blood and urine. The reference materials need to have the relevant biomarkers diluted to low allele concentrations in a background of wild-type DNA. The physical form of the DNA also needs to have a similar physical form (low molecular weight) to the ctDNA. 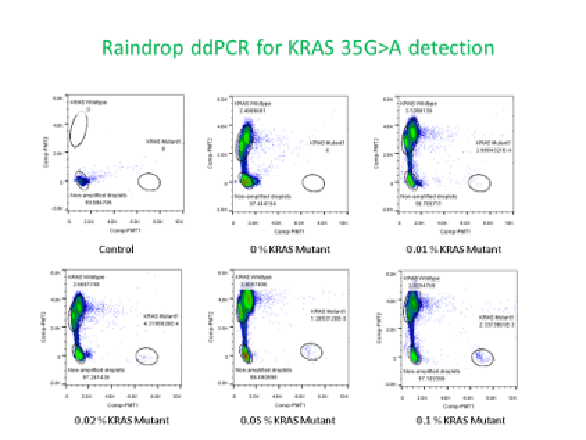 We are currently developing the expertise in the measurement of low frequency alleles using quantitative PCR and droplet digital PCR of model mutations (KRAS and BRAF) that occur frequently in cancer. Mixtures will be made using different synthetic spike-in samples in a background wild type DNA. NIST genomic DNA sequence reference materials will be used as the source of wild type DNA. Different physical and enzymatic methods will be tested to make a reference material with a physical form similar to the circulating tumor DNA. Candidate reference materials will be developed and distributed to the EDRN and other labs. The results will be analyzed at NIST with the help of statisticians. Improvements in the reference materials, the sample processing steps, and measurement techniques will be implemented through the interlaboratory testing process. We will work the labs to improve the quality of their measurements. We plan on using the candidate reference material in interlaboratory studies with the EDRN labs to improve the confidence of the measurements done. In this manner we will work with the EDRN to improve the quality of the data produced increasing the confidence in the validation of ctDNA for cancer diagnosis and monitoring of cancer therapy. SeraCare Life Sciences and NIST have signed of a three-year Cooperative Research And Development Agreement (CRADA) to advance development of circulating tumor DNA (ctDNA) diagnostic assay reference standard materials.